This is my Autumn’s End quit. It is a darker color than I usually work with. It’s got black, browns, oranges, maroon, and a few bits of a creamy off-white. 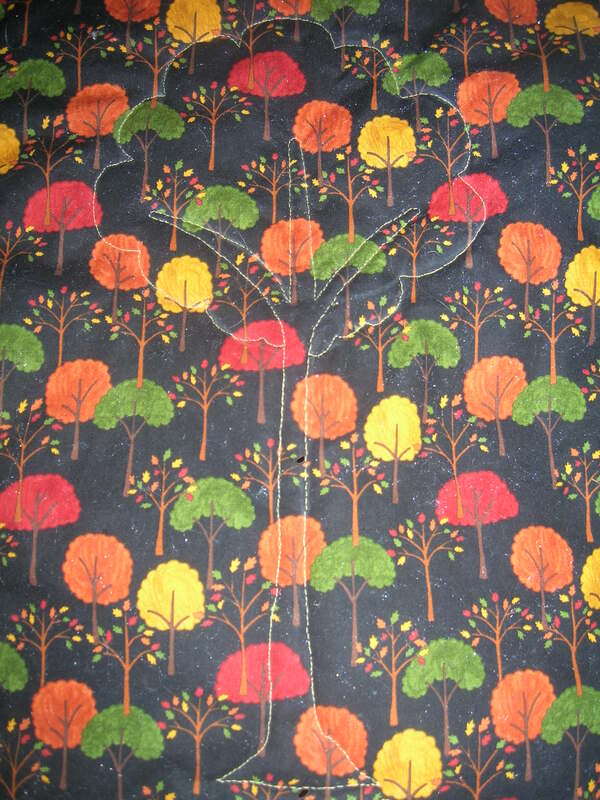 I bought this fabric during the period of time that isn’t quite the end of summer, but isn’t quite the start of Autumn. The leaves were just beginning to hint at what color they might become and I was inspired by their possibilities. I put a big panel of the black tree material in the center and stitched a tree design into it that copied the design in the fabric itself. It’s more of a crib sized quilt than a throw. It’s not a baby-themed quilt, but it would work for a baby born in the Fall and does work nicely over the legs and feet when you’re curled up on the couch with a book. And the cats definitely approve of it. I had to shoo Buddha Cat off before I could take the picture. It’s currently in the laundry getting cleaned up. I’m having mixed feelings about it now that the leaves are almost gone from the trees. Because no leaves on trees = snow is coming soon. As a matter of fact, the leaf removal squad (city workers with this neat leaf vacuum) are going around the neighborhood sucking up the leaves. Soon the huge piles of leaves lining the streets will be gone and the ground will be ready to capture any snow that should fall. Growing up in the Midwest you’d think that I’d really like snow and relish its appearance. That is not the case. I moved to California and got totally spoiled by peony trees and hibiscus blooming in the 70 degree weather in December. I was very sad to move to DC, but I am liking the seasons and the habit snow has here of coming down and closing the entire Metro Area for accumulation of an inch or more and then melting the next day. I am NOT thrilled by the enormous blizzards and 26 inches of snow we’ve been getting about every other year, and 2 last year, but the snow melts quickly. It’s almost like Colorado, but swampier and with more politicians. But as we enter December we also enter Christmas Cookie Season. I celebrate it like I celebrate Advent, but instead of lighting candles each Sunday and saying a prayer for the well-being of mankind, I get on the scale and pray that I’m not up more than a pound or two. Since I’m hosting my husband’s family here I’ll be making about 6 or 7 different kinds of cookies. 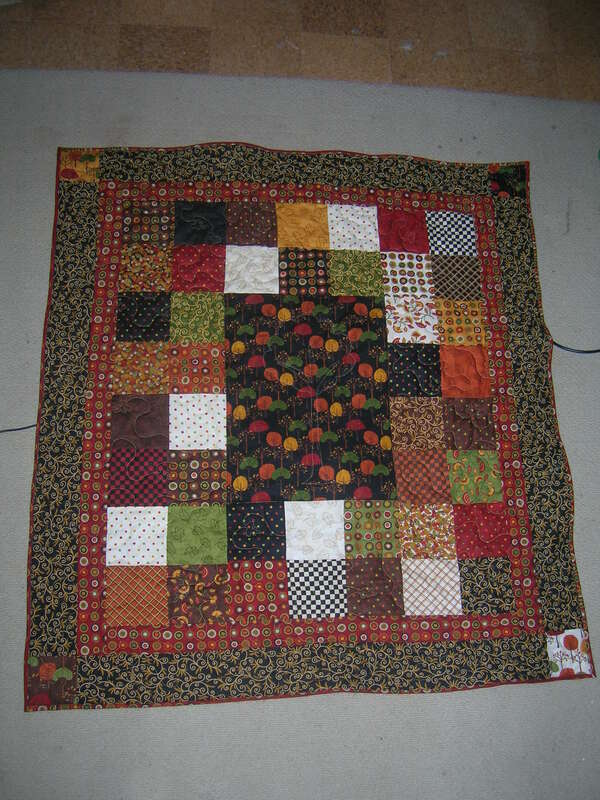 Plus I have a quilt that must get done by mid-December so keep looking for those updates, too. And a word about the show. It’s on Saturday. I have my quilts and bags done. I’m pricing this week and getting my display ready. I’ll be posting pictures and an update about the show on Sunday or whenever I’m out of my post-sales coma. Like the personal stories that come with the quilting photos. That black tree material is so cute!